This set of swirled infinity pieces is sure to raise your style standard! 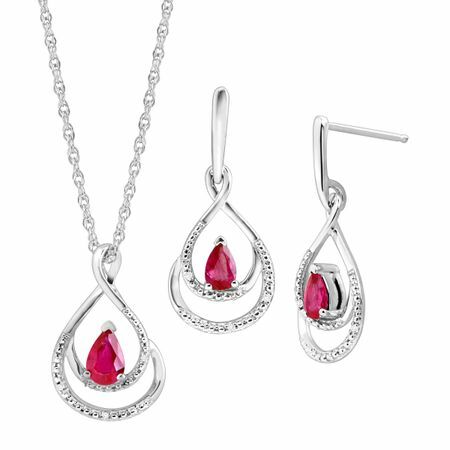 A total of 1 1/10 ct pear-cut natural glass-filled rubies are the focal point of this pendant and earrings set, crafted in ribbons of sterling silver and accented with round-cut diamonds. Earrings measure 1 by 7/16 inches. Pendant measures 11/16 by 1/2 inches. Pendant comes with a sterling silver 18-inch rope chain with a spring ring clasp.